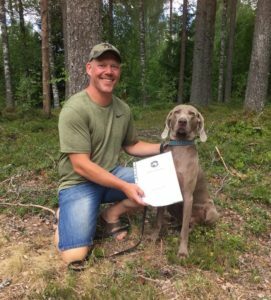 Snaiper’s Mad Max (Falco) succeeded with full points 10-10 on the retrieve test, water work and track in youth class and was honoured with the best team nomination by the judge, Mr Ingemar Roselin. 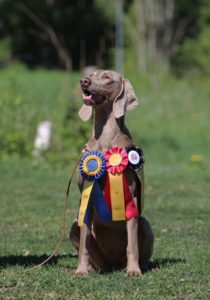 Congratulations to Sara and Svante, we are so happy that you make that grey dog look so good! 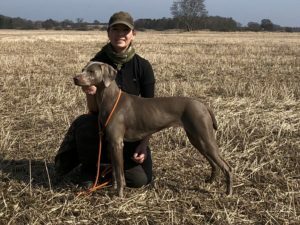 Snaiper’s Thelma CAC, Nordic CAC and BOS at international show in Hässleholm this weekend. Many thanks to Tina Gavling for handling her! Snaiper’s Mad Max, Falco, has passed the bloodtracking ability test. Congratulations Sara and Svante! 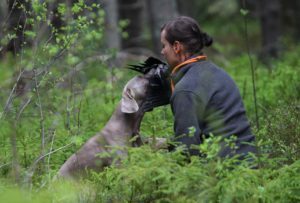 Big congratulations to Satu Pränni and Northern Arrows kennel in Finland! 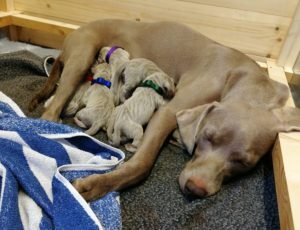 7 strong puppies were born this morning to Trubon Ghuste Trakhaos – Khaos and our Snaiper’s Luke. We are looking forward to our new little star to move to Sweden in the end of the summer. 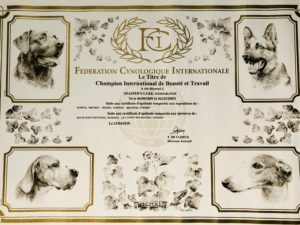 Finally, the last title, CIBT – International Beauty and Working Champion is confirmed for Snaiper’s Luke. It has been a hell of a ride and he has enjoyed every bit of it. 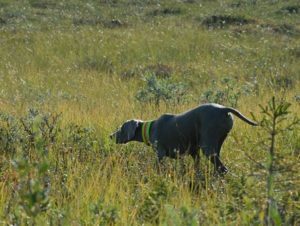 It has been a great journey with many new friends and interesting insights, especially in hunting trials abroad. Snaiper’s First Litter Turns 11! Snaiper’s first litter turns 11 years today, happy birthday Izzie (Muru), Indy and Isa (Leia)! Sadly, Leia is among the stars since many years due to a tragic accident. She is still one of the brightest stars for me in the night sky. Indy and Muru still brighten our every single day. 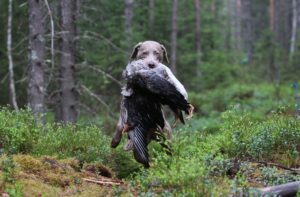 Such beautiful hunters, hope for many more happy hunting days together! 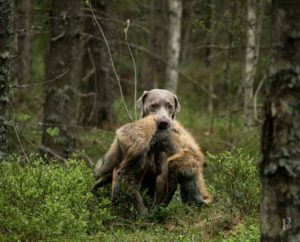 Today’s ultra confirmed that puppies are expected after Trubon Guste Trakhaos – Khaos and Snaiper’s Luke http://snaiperdogs.com/en/our-dogs/snaipers-luke/ in Finland in mid May. 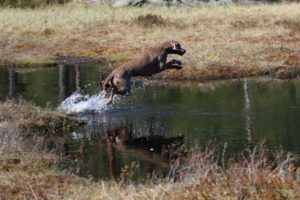 Khaos is an import from England from working line breeder Suzi Burton and has American, English and German working lines in her pedigree. 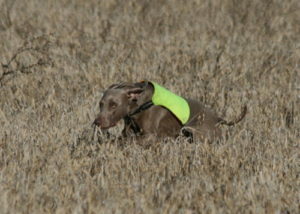 Khaos is a small, fast and alert hunting dog with a lot of drive and great action in the fields. 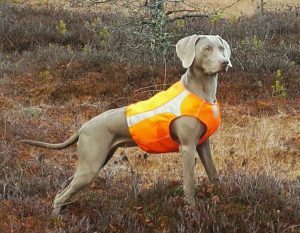 She is merited with 1st prize in open class in field trials in Finland with high score of 89 points, HD A, show Excellent in working class. 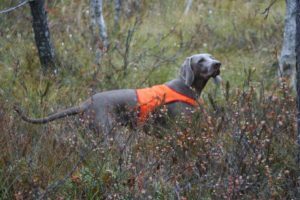 Khaos has great hunting drive with great nose, she works independently, at the same time she is easy to train and easy to handle. Stable mind and fantastic temperament. 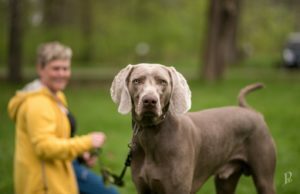 We hope for a bunch of strong and healthy puppies with a lot of drive and really nice character. 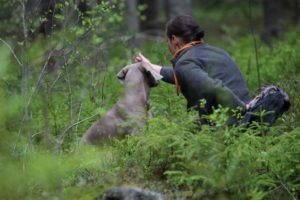 Puppies will be born at the Northen Arrow kennel i the north of Finland, breeder Satu Pränni (tel +358 44 525 5498, e-mail: satu.pranni@outlook.com). 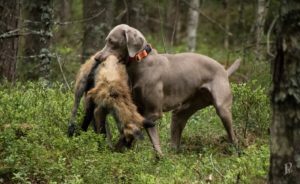 Welcome to contact us if you are looking for a serious hunting buddy and your best friend for life. Gotland is one of my favorite places for the field trials. The landscape is special on this island, open and low, it seems that there is more sky on Gotland than anywhere else. Its almost always windy. And the birds are wild. 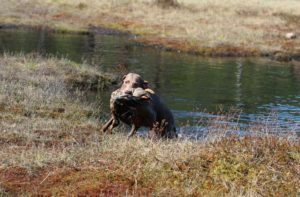 It is a real challenge to achieve a prize in a field trial here, the dogs have to be precise and solid in their bird handling to manage the wild partridge. 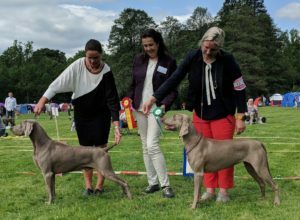 We had a nice training weekend together with the GSP club and today we were lucky to get 1st prize both with Thelma and Ray in open class! 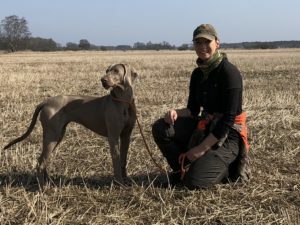 The weather was warm and sunny, with only a light breeze, huge grounds to cover and many wild partridge couples out in the fields enjoying the sun. 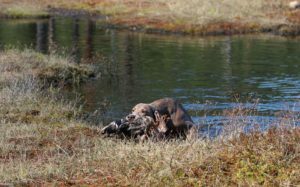 More than pleased with our girls, they worked very well in the heat – with high speed and good range. 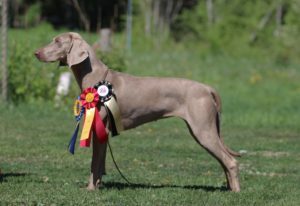 Thelma’s next start is in elite class, Ray has one more 1st prize in open class to achieve.